Longwood swimming has already shown me strength and determination. Not only did I get the amazing opportunity to go to nationals, but I also got to meet people that have become my close friends. Being a freshman it is hard to make friends and having a swim club has given me the opportunity to quickly find a group and connect with others. 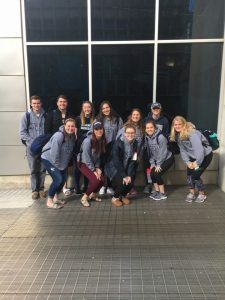 Though meeting others within the Longwood swim club is amazing, the opportunity to visit other colleges and swimming has also been a fantastic opportunity. I hope that as I continue to swim and be part of the club that I can connect with other swimmers as well.